St. Joe’s Sports Dome is the largest sports dome in Michigan, located on Schoolcraft College’s campus in Livonia. 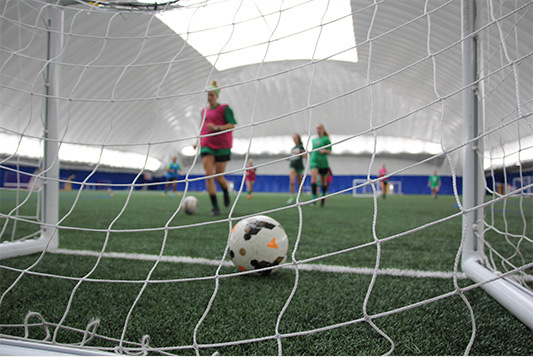 The dome is equipped with a full regulation soccer field and is also used for volleyball, baseball, softball, lacrosse, and other events. The dome is the home to the partnership with the Wolves and Hawks Soccer Club and Mercy Elite Sports Performance. SC Elite is a collaboration between Schoolcraft College, Saint Joseph Mercy Health System, Mercy Elite Sports Performance (performance training and rehabilitation), and the Wolves and Hawks soccer club (Detroit’s premiere soccer association). SC Elite combines performance nutrition with performance training from Mercy Elite and health care excellence provided by St. Joe’s Health System. Learn more about our SC Elite Partners.